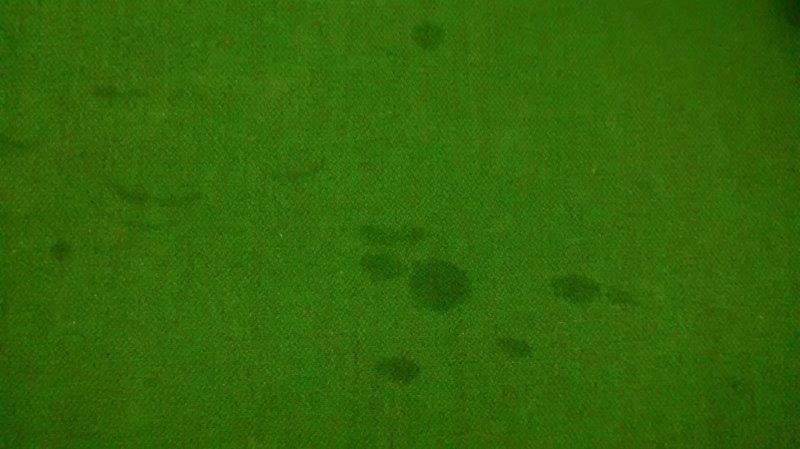 Despite the fact that all bowling clubs have rules in place such as no eating or drinking anywhere near the playing surface it never ceases to amaze as you travel around the indoor bowling clubs of the UK just how many stains and marks appear on the green. Mysteriously many of these seem to appear overnight with no one apparently knowing how they got there in the first place! Natural body phenomena is understandable when someone collapses on the green and we unfortunately experience things like blood, vomit or urine on the carpet. Thankfully these are not regular occurances at clubs but with a fantastic sport that allows people of all ages to play they inevitably do happen from time to time. Many of the stains are caused by drink spillages which either leave a tannin residue in the case of tea or coffee or red wine, or a sticky residue from beer, fruit or fizzy drinks which have a high sugar content. Another two constant offenders which do create a problem are chewing gum or rosewater and glycerine, which is sometimes used as a substitute for grippo. These types of stains would normally be removed in the carpet cleaning world with the use of solvents but as solvents cause structural decay in the rubber backed undelay this should certainly not be contemplated by clubs as a remedy. Chewing gum can be removed using freezer sprays where you then have to chip away at the frozen gum but is somewhat labour intensive and I am currently doing tests on enzyme based products to remove the oily stains from rosewater and glycerine. This website will be updated as soon as I have results from these but my recommendation would be to ban rosewater and glycerine and allow Grippo or its equivelant as long as this is done in the changing rooms . Some stains will have to be removed using a conventional water based extraction system with the appropriate chemicals required, however the risk associated with this of leaving a waterstain is alleviated by the use of industrial turbodryers. This enhances or accelerates the drying process which in turn reduces green downtime and resultant loss of rink revenue. The turbodryer can be directly placed over the affected area for an accelerated drying process or used as an air mover for the whole of the bowls playing area. 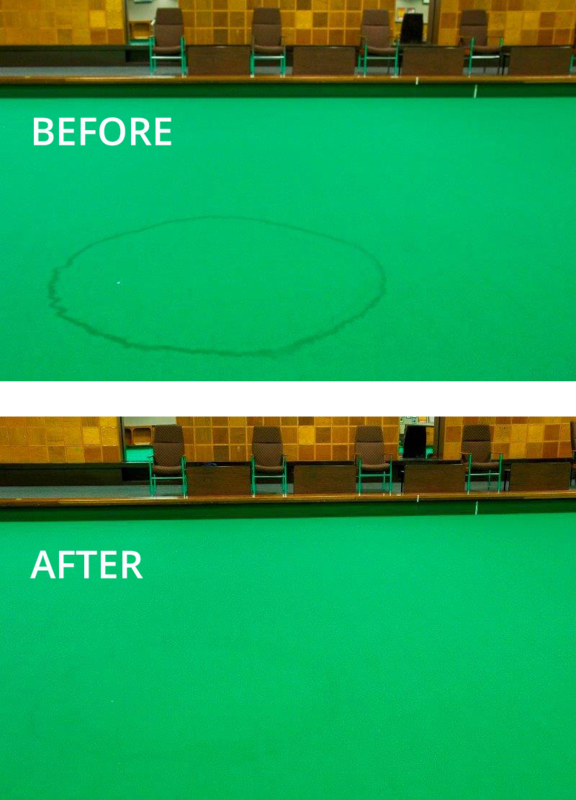 We have therefore a multitude of different types of stains which can all be removed once identified However the most common stain experienced by bowls clubs is from water which can come from a variety of sources, leaking roofs, condensation off heating ducts, burst pipes etc. etc. The term ‘water stain’ is a bit of a misnomer as it is not the water that stains the carpet, it is the drying process and the dirt trapped within the carpet that causes the stain. A bowls carpet is very open weave and unless vacuumed thoroughly using an industrial cleaner the dirt becomes trapped and because the carpet is made of polypropylene it tends to be held there by static retention. When you have a water leak the water drops through the carpet and as the underlay and carpet are not absorbent the only way for the water to travel is to migrate outwards. In a bowls carpet this process is exacerbated further by the carpet itself which in the manufacturing process is woven from very long thin strands thus assisting the outward or lateral migration of the water. As the water travels it takes with it the dirt trapped in the carpet and as the carpet eventually dries out, it leaves a water mark or tide ring. This is why depending on the severity of the leak we often see these stains several feet away from the actual spillage area and are particularly unsightly with a dark ring on the outer edge. Water stains therefore give an indication of how dirty the carpet is, the darker the stain reflects the level of dirt that you have trapped in the carpet itself which obviously needs to be addressed if clubs want to maximise the life of the carpet. By using specialised products we are able to remove the majority of the stain but the degree of success depends on how bad the stain is and the length of time it has been in the carpet. If you would like more information on stain removal, or have a specific stain problem relating to your bowls carpet please feel free to e-mail me and I will do all I can to assist or point you in the right direction. 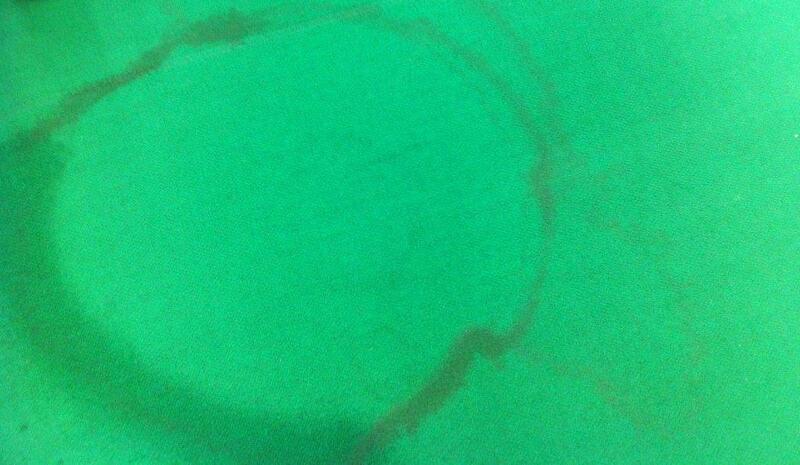 A typical rosewater and glycerine stain on a green which certainly blights the appearance of the green and is not easy to remove. I am currently doing tests using enzyme based cleaners which in theory digest this type of oily based stain and this will be updated once the results are known. Grippo if used and polished off in the changing rooms or at home does not present an issue, the problem is when players do the this on the green. As we all aware Grippo can become very crumbly as it gets older in the tin or tub and this clearly what has happened in the photograph as it would appear that a bit has broken off unnoticed and subsequently been trodden into the carpet. Grippo is a waxed based product and although bits can be picked out of the carpet it is extremely labour intensive and impossible to remove completely. 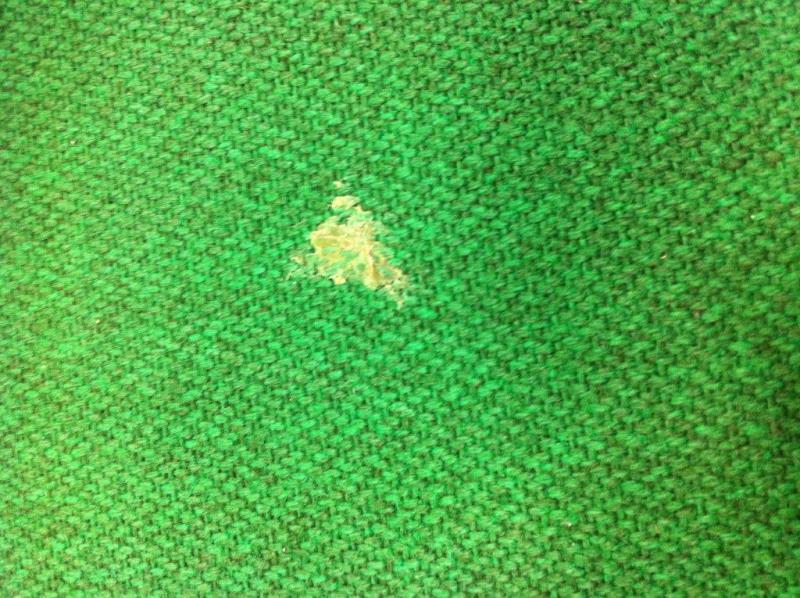 A grippo stain nicely trodden into the carpet ! "The carpet at Stanley IBC has been down 15 years and had some really bad water marks as a result of various leaks from the roof over the years. We thought we had to live with them forever but how wrong we were! All this came about following a demonstration of a Proweave Sportsvac which has been supplied to quite a number of indoor bowls clubs. 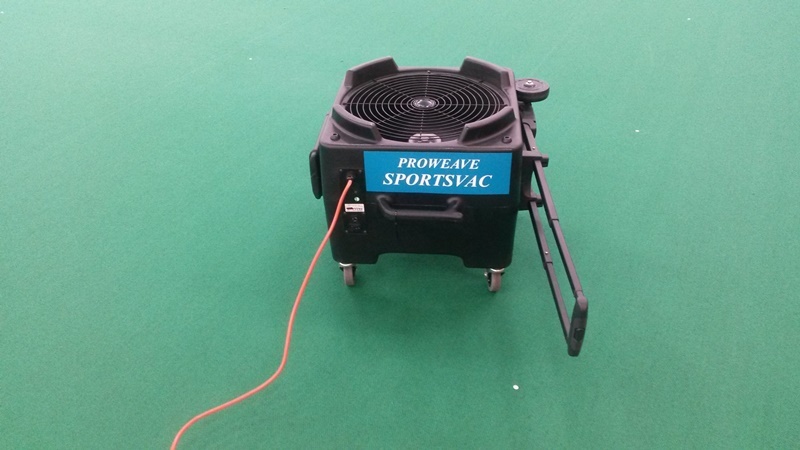 This vacuum, which was demonstrated by Simon Davies of Proweave Cleaning Systems Ltd who is himself a fellow bowler; it was easy to use and picked up an incredible amount of dust from the carpet and we ordered one straight away. It was through Simon we learned these water stains that made our green look tired and shabby could be significantly improved upon. We agreed to give it a go although bearing in mind some of these stains had been down for at least 7 years and we were not holding our breath. A week later when we could manage to close the green for a day, Simon returned and working alongside Peter Hiom of Dales Sports and using specialised equipment cleaned all eight rinks in about 5 hours.